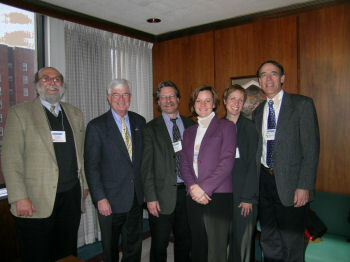 Several Mary Washington faculty went to Richmond on January 11, 2007 to talk with our representatives in the Virginia Legislature and participate in Virginia Higher Education Advocacy Day. The event is organized and sponsored by the Faculty Senates of Virginia and the Virginia Conference of the American Association of University Professors (AAUP). This marked the fifth consecutive year for the event. Faculty from Mary Washington included Ernest Ackermann, Stephen Fuller, Angela Gossetti-Murrayjohn, Mary Rigsby, and Craig Vasey. Mary's husband Leo Rigsby also was part of our group. We spoke with John Chichester, Mark Cole, Bill Howell, and Bobby Orrock, and left materials or spoke to the legislative aides of Ed Houck and Harvey Morgan. We focused on the items in the three position papers published for the event: Higher Education Governance - Faculty Competitiveness - VRS. Senator Chichester was the recipient of the second annual Colonel Michael S.Harris Award to a Virginia public official who has shown exemplary support for higher education in the Commonwealth. The award is given by the Virginia Conference of the AAUP. The picture in this entry shows the delegation from Mary Washington with Senator Chichester in his office after he was presented with the award.